In my role as Chair of the American Board of Internal Medicine (ABIM) Internal Medicine Exam Committee, I have seen firsthand how ABIM invites physicians from a diverse range of practice types and external stakeholders to join its governance and exam committees. Over the past year, ABIM has initiated additional ways to bring more and varied physician perspectives to its work. I participated in one such effort, specifically taking part in the Committee’s work to update the Internal Medicine Maintenance of Certification (MOC) exam blueprint. ABIM remains committed to including a knowledge assessment component in MOC program even as it works to implement the Assessment 2020 Task Force recommendation for more meaningful assessments. As MOC knowledge assessments evolve over time, broad physician input about the relative importance and frequency of content areas will remain essential, helping to ensure that assessments fairly evaluate physician competence and knowledge currency. Last year, ABIM invited internists to rate the Internal Medicine MOC exam content areas on relative importance and frequency in practice to update the exam blueprint. Those ratings informed updates to the current MOC exam and will help guide future assessment content decisions. ABIM then invited a group of internists from various regions, practice settings and age ranges to help set the standard for the updated fall Internal Medicine MOC exam. The standard reflects the level of performance required to pass the exam. ABIM relies on this evidence-based, peer-defined approach to setting the exam’s minimum passing score; it does not set pass rates. Physicians received training about the process and, together with members of the Internal Medicine Exam Committee, reviewed exams to determine the number of questions that must be answered correctly to pass. Using their input, the ABIM Internal Medicine Specialty Board—comprised of physicians with expertise in the discipline—then set the passing standard. It was wonderful to meet and hear feedback from the physicians who participated in the standard setting sessions. Several reported that they found the experience to be useful and appreciated the opportunity to learn more about and have input to the process. Even more rewarding, however, was hearing the feedback to ABIM from peers who sat for the fall Internal Medicine MOC exam: Physicians have shared with us that they felt the exam was more relevant to their professional lives and there were less esoteric questions. Just as the work to inform the Internal Medicine MOC exam blueprint has expanded to more subspecialties, ABIM now plans to invite more physicians to participate in standard setting as other subspecialty MOC assessments are updated. 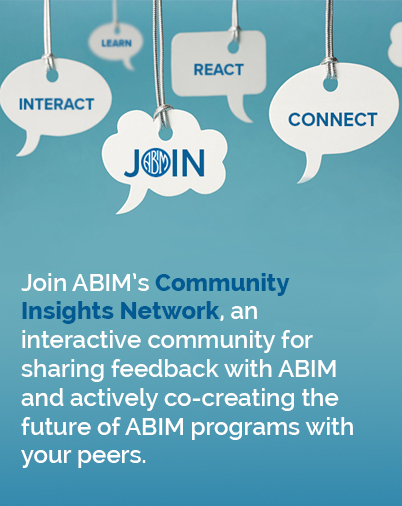 ABIM is committed to being more inclusive and transparent to create a credential that captures the pride you feel by staying current in your discipline. Please continue to email Dr. Baron with your thoughts and ideas about MOC and subscribe to the Transforming ABIM blog to learn more about additional opportunities to provide input.